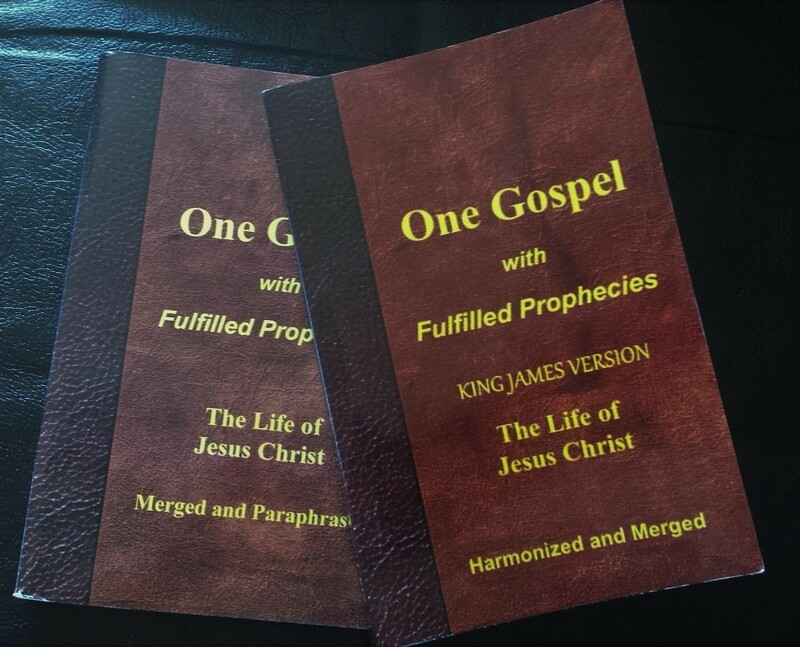 One Gospel with Fulfilled Prophecies is a book that harmonizes and merges the Gospels in chronological order with a major focus on fulfilled prophecy. 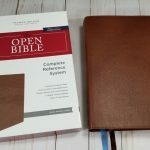 The goal was to merge the story of the life of Jesus into a single volume and include Old Testament prophecies showing that Jesus is the Messiah. 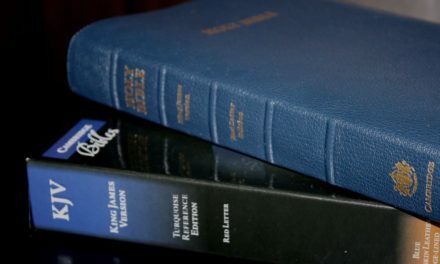 The simplified explanation of the KJV edition is the verses are combined and the books are identified by a color code. Prophecies are placed in yellow boxes. 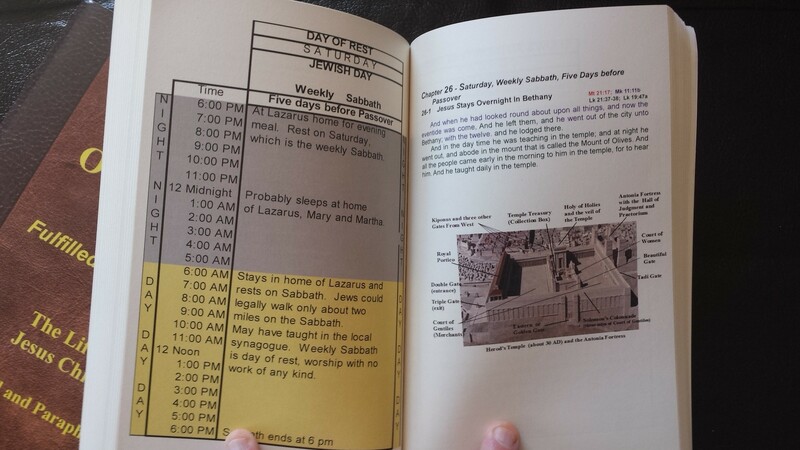 The Scriptures are presented in a single column paragraph format without verse numbers. Poetry is in poetic format. I’m guessing it’s around a 10-point font. Every word is a specific color. The colors match the references given at every section heading. The references are also printed in the same color as the text they correspond to. 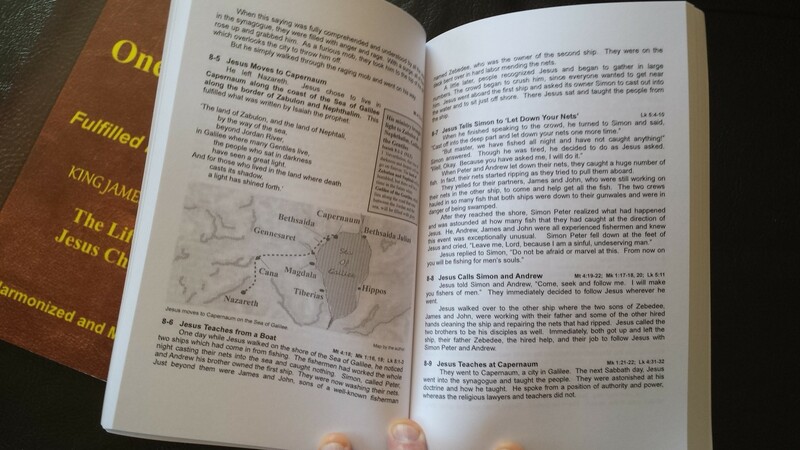 The section headings match the table of contents in the front and work as an outline to the Gospels. That’s it. It’s that simple. There are a few additional features. Including maps, photos, and charts. The prophecies are placed in yellow boxes. 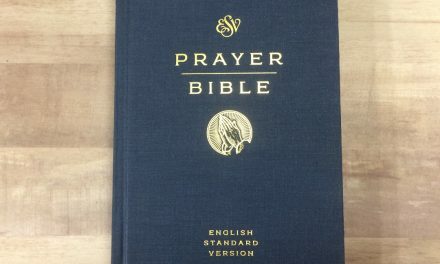 There are 100 prophecies included. It gives a title for the prophecy, the reference, and the text of the Scriptures. The applicable portion of the text is in bold. One of the most impressive things about the maps is that Larry created them. They look fantastic. Many are in color. 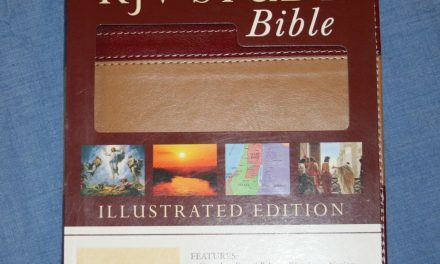 The paraphrased edition doesn’t have the color that’s found in the KJV. This does help general readability a lot. The paraphrase itself is actually a minor edit of the KJV. It modernizes the wording, adds words to connect stories, and identifies the speaker. Dialog is placed in quotations. Any notes supplied by the author are placed in brackets and italics. This edition does not include the charts. It adds a photo of a limestone engraving found in Caesarea. 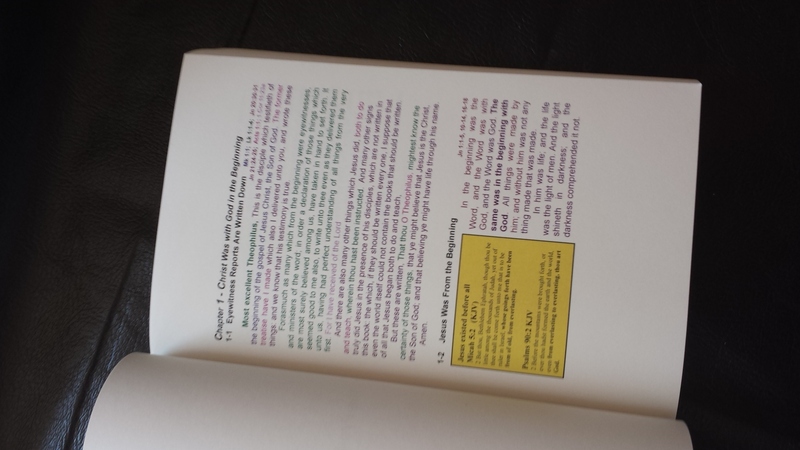 Even though the KJV text looks busy with all of the color, I actually enjoy reading it. There are a few places where the words or phrases repeat. This is due to the thoroughness of including all of the text. This makes it difficult to read but the color helps keep it separate. Overall it’s a far better tool for study and teaching than just reading. It is an excellent tool for study because you have all of the events together in chronological order that’s easy to see. The many section headings helps with the chronology. I met the author, Larry Aldrich, at this year’s ICRS in Orlando. 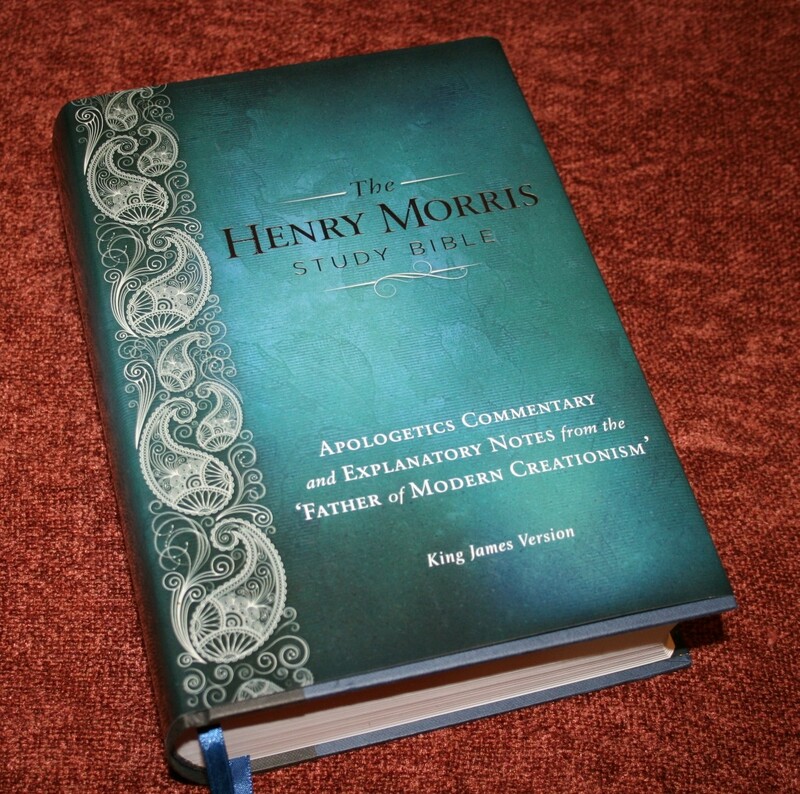 He stepped me through both editions and showed me very quickly how easy it is to use, and how useful it is in personal study and sermon/class prep. 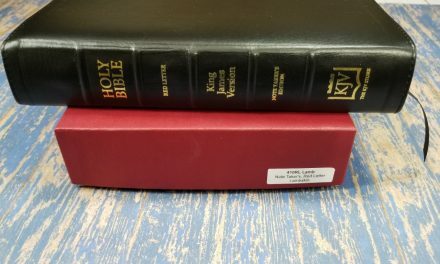 Larry recommends the paraphrased edition for evangelizing with those not familiar with Christianity and the KJV edition for study. No matter which edition you use, One Gospel with Fulfilled Prophecies is an excellent tool for digging deeper into God’s Word. It’s available in Kindle, paperback, and hardcover formats at Amazon.com. 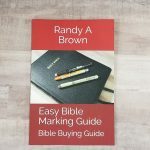 You can see the website here: onegospelbooks.com for more information and free downloads. I received this books for free from the author for review. I was not required to give a positive review. Only an honest review. 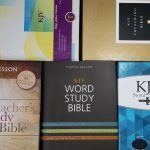 Do you know where to find the KJV one? I can only find the Paraphrased version. All the major online book stores only have the Paraphrased version. Even the Publisher Only has the Paraphrased version. I agree 🙂 I’ll see if I can contact him. Thank you Randy very much for your assistance. I contacted the Publisher with an email that has a 48 hour or less response time. So appreciate the time a five-fold minister and our brothers and sisters in the Faith put forth the effort to bless the body of Christ. I bought the Kindle book for the Paraphrased version and it is still a blessing. Hi James. Thanks for sharing the update. That’s good to hear.